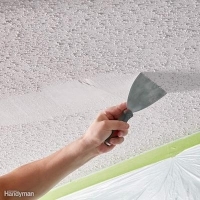 Most people really aren't that fond of popcorn ceilings. They were very commonally installed through the 70s to the 90s. But don't worry, there is a simple way to remove it with little fuss or mess. It means the purchase of a Porter-Cable 7800 Sander with Dust Collection. The cost is around $1000.00 Canadian at Home Depot or Sears, but it is somewhat less expensive than employing a contractor. It takes a bit of your time and muscle, but it does a great job. Keep in mind however, if the ceiling was installed before 1978 it could contain asbestos. If that's the case, I suggest using only a qualified contractor.